American Typewriter font is used in a variety of places and ways. It can be used in business projects, edgy designs and where a nostalgic look is appropriate. Where to Download Free American Typewriter Font? Many websites offer free fonts for download. However, there are reasons to be wary of some "free" font sites - for more reasons than simply viruses or malware that could be included in the download. You should only download a free version of the font if doing so is legal where you live and if the download is from a reputable site such as the ones listed below. UFonts: You will find the Medium BT Font version of the font at this site. Eaglefonts: Here you'll find the ITC American Typewriter Light Condensed. 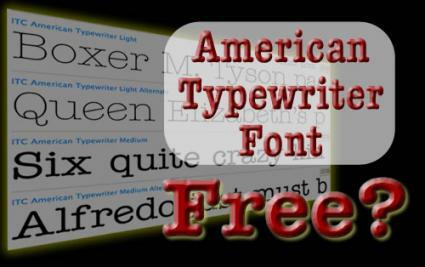 Fonts Geek: You will find the American Typewriter regular font available for download at this site as well as several related fonts. Fonts Log: Here you will be able to download a free version of AmerTypewriterITCbyBT-MedCond. Urban Fonts: This site features a version of the American Typewriter font, as well as 8,000 other options. Fonts Up: Check out the free version of American Typewriter Light available here. There are other options where you might be able to find the American Typewriter font. Other places to search for the font are on torrent search engines. Before downloading any file, check to make sure that you can download it legally and run it through a virus checker to make sure it is safe. Other places to find the font are free online text-image editing or online banner creation websites on the Internet. Torrentz: This torrent search engine combines results from dozens of torrent search engines. Torlock: This site pays their users a commission when they uncover fake torrents and report the findings to their community. This helps weed-out bad downloads. Cool Text: Create a banner using fonts similar to American Typerwriter. Font Squirrel: This site offers the font "Courier Prime" which is very similar to American Typewriter. It's possible that the font might already be installed on your computer. Look for a True Type font icon which is a blue page with a dog-eared corner and two overlapping Ts in the center. If you are using Mac look for an Open Type font icon which is an O symbol. Here is how to check if you have the font on various popular operating systems. There are two ways to check to see if the font is already installed in your system. The computer will return results that match your search. Look for a "True Type Font" icon to see if you have the font. American Typewriter font was created in 1974 by designers Joel Kaden and Tony Stan for International Typeface Corporation. It was based on the form of the letters produced by early typewriters, which was patented in 1868. The creation of the font was much more an artistic endeavor than it might seem; part of the charm of the typewriter was the slight variations in ink pressure, in the way the ball hit the paper, even in the shades or age of the typewriter ribbon. A computer does not have these variations - every letter, every word on the screen or on the printed page would be identical by default. The font is very similar to original typewriter lettering, with a few exceptions such as the R,e, & and the $ sign. The font was designed in a way so each letter takes up the same amount of space, also known as a "monospaced" typeface. ITC American Typewriter LT Light Condensed AlternateITC American Typewriter Light Condensed. Whether you need it for a personal project or to promote a business, the American Typewriter font will help to create a nostalgic, professional and edgy appearance. The font can be used in business cards, flyers and other projects.